SAINT-ÉTIENNE DE LA TOUR, AGATHE (Marie-Agathe) DE (Bradstreet; Campbell), allegedly the sole heiress of her grandfather Charles de Saint-Étienne* de La Tour; b. 1690 at Cape Sable, daughter of Jacques de Saint-Étienne de La Tour and Anne Melanson; d. some time in or after 1743, probably at Kilkenny (Ireland). After Jacques de La Tour’s death around 1699 his children were placed by an act of the lieutenant-general of Acadia under their mother’s guardianship. Agathe spent her early years at Port-Royal (Annapolis Royal, N.S. ), and married, in succession, two English subalterns attached to the garrison of the town. She first married Lieutenant Edward Bradstreet, who died in December 1718. They had at least two sons, Simon and John*, who became British army officers. Her second husband was Hugh Campbell, and after his death (before 1730) she was left with five children. 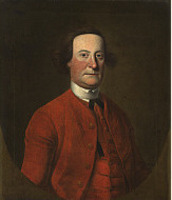 In 1729 the governor, Richard Philipps*, expressed his desire to annul the former land grants in Nova Scotia in order to create new ones, and to this end he requested a survey of the properties. The English authorities wanted to acquire land for the British subjects – Protestants for the most part – whom they were inducing to come to settle in Nova Scotia. Mrs Campbell, who had become a widow for the second time, saw in this the means of becoming rich by asserting her rights to the former properties of Charles de Saint-Étienne de La Tour, so that she could sell them to the British crown. By the terms of the decree of 20 March 1703 issued by Louis XIV’s council of state (see Charles de Saint-Étienne) her family had in fact received from their ancestor Charles’ succession a fifth of the Cape Sable fief and two of the seven parts making up the seigneuries of Port-Royal and Les Mines (Grand Pré, N.S.). In 1730 Agathe owned only a quarter of what had fallen to her family as its share; nevertheless, in 1725 she had laid claim to all of her ancestor’s seigneuries, alleging that her brother and sisters, as well as her uncles and aunts, had given their shares over to her when Acadia had become English territory. In 1730 she presented a second suit, similar to the first and accompanied by three alleged deeds of transfer on the part of an uncle and two aunts. After Philipps ordered the payment of seigneurial dues to cease, Mrs Campbell went to London to plead for the restoration of her rights, or adequate compensation for them, and in May 1732 made her first petition to the Board of Trade. 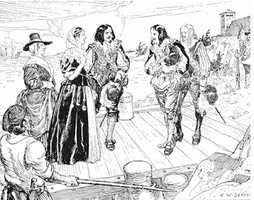 Philipps was suspicious about her claim to possess all the rights to the La Tour inheritance, as was Lieutenant-Governor Armstrong. Nevertheless, in October 1733 the Board of Trade recognized the legitimacy of Mrs Campbell’s claims, “partly by right of inheritance and partly by cession from her relations.” In March of the following year, the board recommended that she be paid £2,000 for the purchase of all her seigneurial rights. The British authorities openly admitted that the purchase of the La Tour lands was crucial if the government was to be able to grant any land in Nova Scotia, and the secretary of the Board of Trade, Popple, pointed out that Mrs Campbell was “in a very weak state of health, and should she dye, her right might then devolve on her children with whom it might not be possible for many years to compleat any bargain.” With the purchase of Mrs Campbell’s rights, the seigneurial system came to an end in Nova Scotia, although other members of the La Tour family later demanded recognition of their inheritance rights. Agathe may never have returned to Nova Scotia. In 1737 she declared that she was “from the town of Kilkenny” in Ireland, and she was evidently still living there in 1743. Her accounts with King Gould show that she was receiving a widow’s pension in that year. Clarence d’Entremont, “SAINT-ÉTIENNE DE LA TOUR, AGATHE DE,” in Dictionary of Canadian Biography, vol. 2, University of Toronto/Université Laval, 2003–, accessed April 24, 2019, http://www.biographi.ca/en/bio/saint_etienne_de_la_tour_agathe_de_2E.html.